Walking the Dog's Shadow rose to the top of nearly eight hundred submissions to win the ninth annual A. Poulin, Jr. Poetry Prize. Tony Hoagland, who served as final judge for the contest, writes, "Deborah Brown's poems remind me a little of the great Polish poet, Wistawa Szymborska. They both make thinking look easy. . . . Brown's poems aren't just about a eureka moment; they taste of the whole journey. Walking the Dog's Shadow is a beautiful book, wise and sure of itself, fresh with wit and gravity, serious and true." Deborah Brown teaches literature and writing at the University of New Hampshire-Manchester. 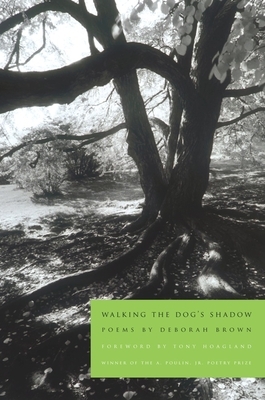 Deborah Brown's book, Walking the Dog's Shadow, is the 2010 winner of the A. Poulin Jr. Award from BOA Editions. Brown is an editor, with Maxine Kumin and Annie Finch, of Lofty Dogmas: Poets on Poetics (Univ. of Arkansas Press, 2005) and a translator, with Richard Jackson and Susan Thomas, of The Last Voyage: Selected Poems of Giovanni Pascoli (Red Hen Press, 2010). Her poems have appeared in Margie, Rattle, The Alaska Quarterly, Stand, the Mississippi Review and others. Brown teaches literature and writing at the University of New Hampshire-Manchester where she won an award for Excellence in Teaching. She lives on a former dairy farm in Warner, New Hampshire, with her husband, George Brown, and four cats. Tony Hoagland was Born on November 19, 1953, in Fort Bragg, North Carolina, Tony Hoagland is the author of witty, poingnant poems that comment on contemporary American life and culture. His books include Unincorporated Personas in the Late Honda Dynasty (Graywolf Press, 2010), What Narcissism Means to Me (2003), a finalist for the National Book Critics Circle Award; Donkey Gospel (1998), which received the James Laughlin Award; and Sweet Ruin (1992), chosen by Donald Justice for the 1992 Brittingham Prize in Poetry and winner of the Zacharis Award from Emerson College.Hoagland's other honors include two grants from the National Endowment for the Arts, a fellowship to the Provincetown Fine Arts Work Center, the O. B. Hardison Prize for Poetry and Teaching from the Folger Shakespeare Library, the 2008 Jackson Poetry Prize from Poets & Writers magazine, as well as the Poetry Foundation's 2005 Mark Twain Award in recognition of his contribution to humor in American poetry. He currently teaches at the University of Houston and Warren Wilson College. "Brown writes with an expectedly mature and knowing voice yet one which betrays no traces of effort in capturing the feeling of awe she often finds in her observations of life. Thus, her poems feel not only very natural and even flowingly light in places, but alsoand without irony or contrastcome forth as powerful bulwarks all the same." "Brown's poems are sharply attuned to absence: things missing, words unspoken.... listen to everything she saysand to everything she doesn't say. It's only in learning to pay attention to what's here and what's not that we can go along with the wisdom of the speaker."